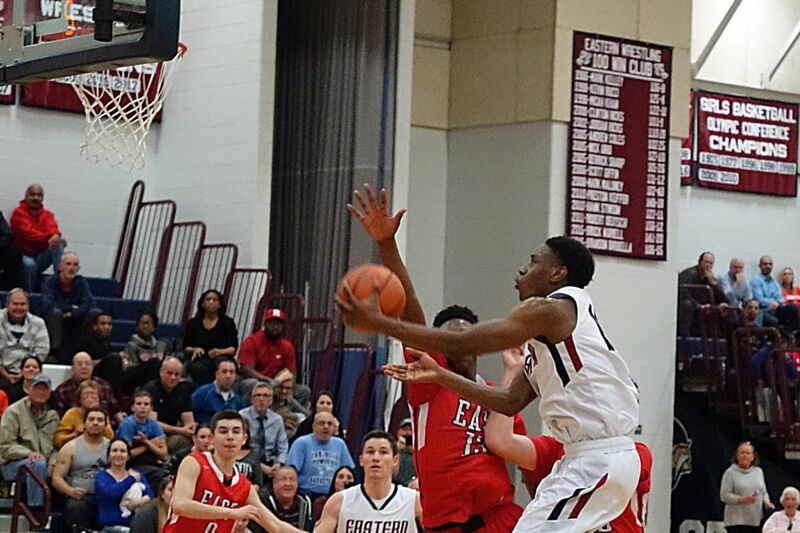 Eastern’s Matt Cotton drives for his winning basket against Cherry Hill East. Eastern boys' basketball coach Kevin Crawford compared playing Cherry Hill East to one of his least favorite activities. The Vikings have played three relatively close games with East with a similar favorable result, but the coach didn't seem to enjoy the experience. "It's like the third time going to the dentist," Crawford said after Tuesday's 58-56 win over the Cougars in an opening South Jersey Group 4 playoff game. Matt Cotton's driving scoop shot with four seconds left was the game winner for the Vikings. Cotton stood past the three-point line holding the ball, waiting for the clock to wind down before making his successful drive to the basket. "I was either going to dish it off or go to the basket, but I felt confident I could make the play," Cotton said. Typical of East, the Cougars made the most of the waning seconds. Eastern's Jack Winsett blocked one shot and then with just 0.4 seconds remaining, East missed a desperation final attempt. This has been a difficult season for the 6-foot-5 Cotton, who is headed to Yale. After transferring from St. Benedict's, he had to sit out the mandatory first 30 days of the season. Shortly after returning, he suffered a back injury that sidelined him several more games. "I am beginning to get in the groove," he said. Cotton had 16 points, while guard Jesse Barbera led the Vikings with 17. Carl Gibson scored 16 of his team-high 19 points in the second half for East. No. 4 seeded Eastern (19-8) will host Rancocas Valley in Thursday's quarterfinal. Cherry Hill East, the No. 13 seed, finished 11-16, but this was the seventh defeat by five points or fewer. For a team that started four juniors, East may have an extended stay next postseason. "We fought hard," East coach Dave Allen said. "We have been resilient all year." Crawford could have especially used some Novocain to dull the pain after Eastern, which led by as many as 19 late in the first half and 18 early in the third quarter, saw East take a 54-53 lead on Gibson's long two-point jumper with 3 minutes, 1 second left. Barbera tied the score when he made one of two free throws and teammate Ryan Ems gave the Vikings a 56-54 lead on a shot close to the basket with 1:36 left. East's Sam Serata (16 points) tied it on two free throws with 1:01 left. Eastern won both regular-season meetings over East, 56-45 and 59-55. They weren't much more fun for Crawford. "I have so much respect for Dave Allen and the East program," Crawford said. "I'm glad we are finished with them this year." In hindsight, a trip to the dentist never looked so good. CHE: Ryan Green 1, Carl Gibson 19, Sam Serata 16, Colin Prendergast 9, Dienye Peterside 11. E: Troy Edwards 10, Jesse Barbera 17, Matt Cotton 16, Ryan Ems 10, Jack Winsett 3, Andrew Heck 2.